Since 2005 HOTTEA has been putting up his public yarn and stencil installations in cities all over the world. He has recently travelled to London, Berlin, and New York. A recent graduate of the Minneapolis College of Art and Design, some of his earliest pieces can still be seen in Minneapolis. Like many other street artists, HOTTEA is an artist who uses a repeated moniker or “tag” in carefully chosen locations to create a creative persona. But unlike many other forms of street art and graffiti, his yarn pieces are reversible and non-destructive; they are left to decay and disappear yet of his pieces leave an indelible effect on each of the cities he works in. 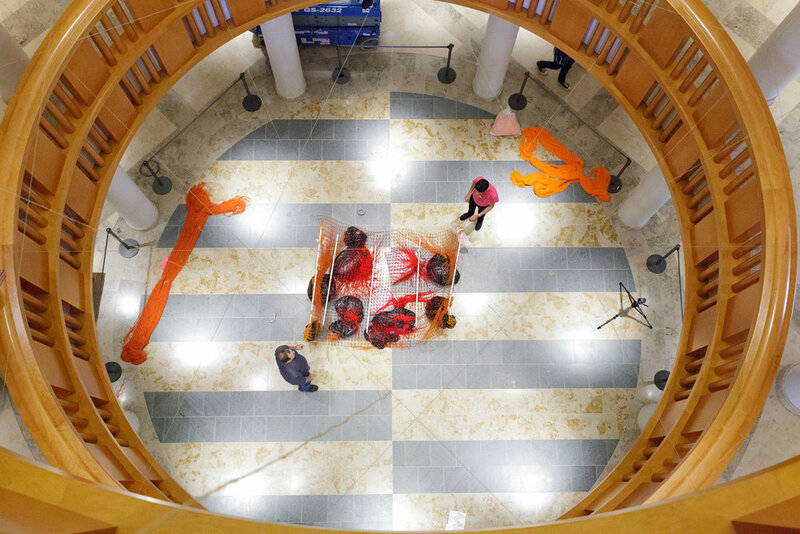 For letting go, HOTTEA’s most ambitious project to date, the artist worked within the complex architectural details of the Target Wing rotunda. It has resulted in a physically light but beautiful, space filling volume. 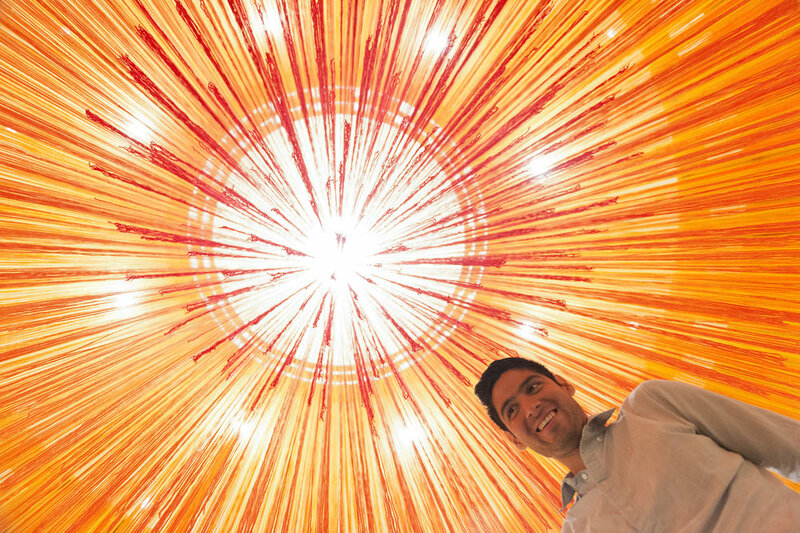 On the ground floor, visitors are encouraged to sit or lie on the grass and look up into the sun-colored cascading strings. Visitors can also stand in the middle and be surrounded by the gradient colors that fill the entire space. 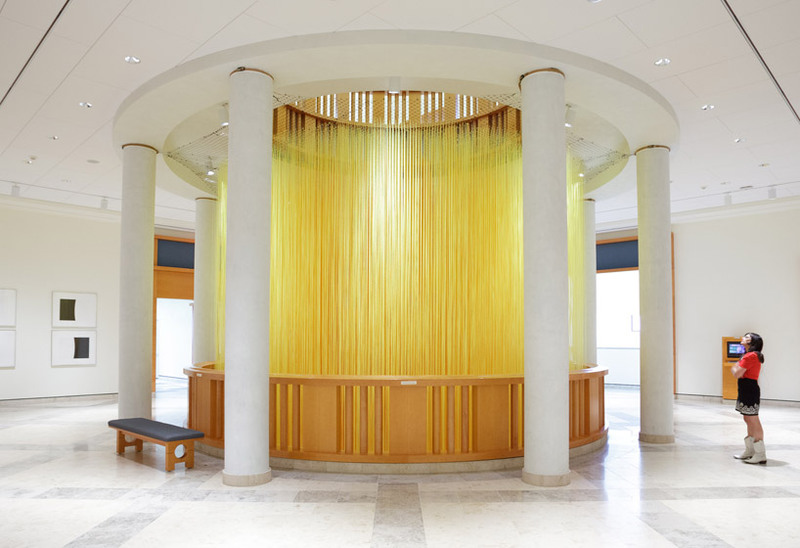 Looking at letting go from the second floor, the thousands of individual strings are a streaky volume that creates a gently disorienting vibration of color that fills the rotunda’s void. 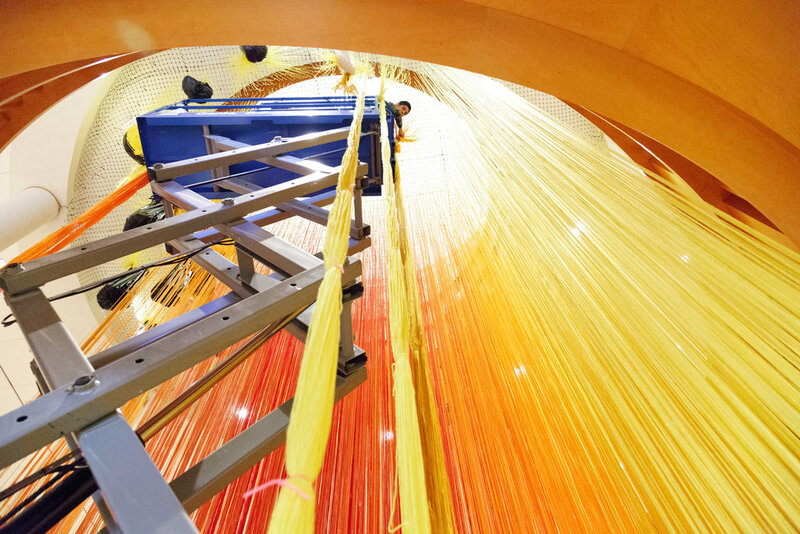 During four weeks of construction and installation leading up to the 2012 Northern Spark event, HOTTEA, Mia staff and volunteers measured, cut, and knotted an estimated 14,000 strings of colored yarn to a plastic fence. Using almost 400 skeins, the total length of yarn in letting go is 82 miles long. That is enough to tie a single string from the MIA to Mankato, MN. Or if it went straight up into the sky, it would reach past the Kármán Line, the border between earth’s atmosphere and outer space. 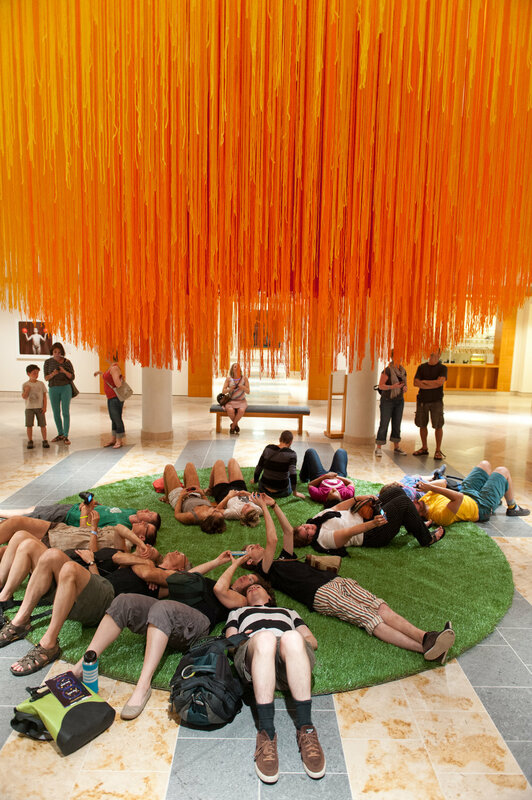 HOTTEA: letting go, Minneapolis Institute of Art, June 9 - 10, 2012.